The “hand lift” might be the hottest new trend in plastic surgery, and if so, you can blame it on selfies! Some camera-conscious women are getting Juvederm injections to smooth out their hands to show off close-ups of their engagement rings. For a temporary fix to plump up or smooth out their skin, or disguise surface veins, they are willing to fork over up to $1,300 for this 5-10 minutes procedure. But hand lifts are hardly the strangest new cosmetic surgery procedure on the menu. Here are seven other plastic surgery trends that might just leave your jaw agape. Get a FREE book, Makeup Do’s and Don’t For Women of a Certain Age, when you get a friend to sign up for this newsletter. New editions of the Barbie doll have the body of an average American woman — with skin that will also look something like “normal,” and an add-on pack that will allow kids to give their dolls acne, cellulite, stretch marks and more. The Lammily dolls, designed by artist and researcher Nickolay Lamm, are scaled to the measurements of the average 19-year-old woman, after becoming frustrated at how unrealistic Barbie’s proportions are. His goal was to create a fun, appealing doll with natural-looking makeup and a casual, sporty wardrobe. The dolls are now available for purchase, and buyers can pre-order an exciting extra — a sticker package allowing kids to add removable “marks” to their dolls, ranging from artistic tattoos to cellulite and stretch marks to grass stains and scars. It remains to be seen how many will order those “exciting” extras. Be honest, how many of you would opt for Cellulite, stretch marks or acne if given a choice. Learn more at: Huffington Post. Let no one ever kid you, being an advocate for change, especially in anesthesia, is about the most difficult task one could ever attempt to shoulder. Hercules should have had it so easy. In 1992-3, after seeing my first 50 cases of propofol ketamine (PK) sedation emerge without PONV or need for postoperative opioids, I felt much like Archimedes, “Eureka. I’ve found it.” PK numerical reproducibility was established with the addition of BIS/EMG monitoring in 1998. I have published 5 peer reviewed papers, 15 letters to the editor in Outpatient Surgeon Magazine, more letters to the editor in Anesthesia & Analgesia, British Journal of Anaesthesia, Anesthesia Patient Safety Foundation, Plastic & Reconstructive Surgery, & Aesthetic Plastic Surgery, a landmark textbook ‘Anesthesia In Cosmetic Surgery,’ and 51 lectures in the US, Canada, Mexico, Dominican Republic, Israel, Malaysia & Singapore. Many people publish papers. However, half of all published papers are never subsequently referenced. My papers have been subsequently referenced in 144 papers and in 50 textbooks. As Aspect’s Dr. Paul Manberg often opined, ‘Change is glacial.’ When presented with my thoughts about getting better patient outcomes, most of my colleagues attitudes were essentially, ‘We’re not killing anyone, why should we change?’ Somewhere Semmelweis’ corpse is turning over in his grave. Actually, as Li reported in 2009 Anesthesiology (110, 759-765), we are killing one American patient every day from anesthesia over medication, the natural result of not directly measuring anesthetic effect on the cerebral cortex. Even more saddening was that the editors of Anesthesiology did not deem this mortality study worthy of being an article of special interest. Part of the human condition is that all people regardless of their profession resist change. Physicians as a sub-set are notoriously resistant to change. DAPs as a sub-set of physicians are virtually impossible to change. Unless presented with this simple paradigm in training, most DAPs will not even consider the notion of a differing paradigm. The DAP syllogism goes like, ‘All surgery is painful. Opioids (narcotics) are painkillers. Therefore, all surgery requires the judicious use of some opioids.’ Having successfully practiced for the past 16 years without intra- or postoperative opioids, I would beg to differ. Postoperative pain is a function of intra-operative pain. Instead of being frustrated with my apparent inability to produce change in my fellow DAPs’ intra-operative conduct, I considered using the same paradigm for change that got fathers in the delivery rooms for the births of their children; i.e. public knowledge leading to public demand. Reason #1: How can a pre-surgery patient know to ask for the best available technology, a brain monitor, if they do not even know that such as thing exists? Reason #2: Why would they ask for one without the knowledge that over medication can lead to delirium, dementia and even death, especially in those over 50? 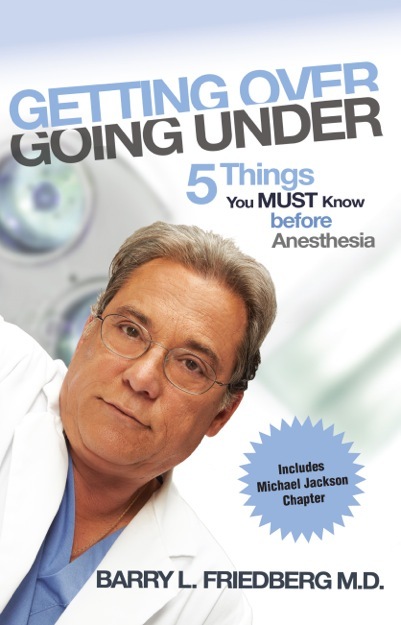 Reason #3: Why would the general public not assume they would receive the best available technology for their anesthesia care, especially if it might improve their chance of waking up without brain fog? Reason #4: Why does PONV still exist and is there is an established way to avoid it? Reason #5: Why does postoperative pain still exist and is there an established way to avoid it? The answers to these reasons are easily digested in his 2010 book for which a free Kindle giveaway this summer was very successful and another is planned for this fall. Board certified anesthesiologist, Dr. Barry Friedberg and I have become well acquainted by now. I have been impressed with his innovations to his field, including a brain monitor device that monitors anesthesia levels for each individual to just the right degree. This is a potentially life saving feature – an important feature for those undergoing any surgery – cosmetic or not. It might save your life or that of someone you hold near and dear. I have written about this before and in more detail. These are things people actually said in court, word for word, taken down and published by court reporters. 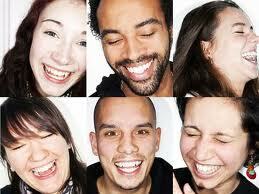 They couldn’t laugh while the exchanges were taking place, but you can – and will! Remember, nothing makes a face more beautiful than a smile. Beauty Within . . . Beauty Without . . . What’s Your Passion? 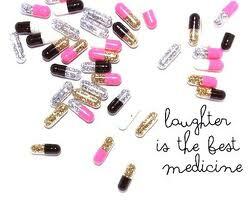 and laughter is surely one of them! WHAT’S HAPPENING WITH STEM CELL FACE LIFTS? Are you beginning to see ads for Stem Cell Facelifts? If so, I’m not surprised! I too am convinced this is the wave of the not-too-distant future. But many of these Stem Cell Facelifts of today are simply fat removed from one part of the patient’s body and reinjected into other parts, as treatment for aesthetic concerns such as crows feet or mouth to jaw marionette lines. 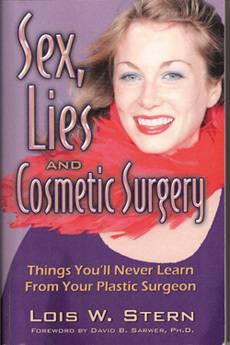 Fat transfer as such is nothing new in cosmetic surgery. It has been used by plastic surgeons since 1983 and is considered extremely safe, but not as long lasting as the fillers of today. 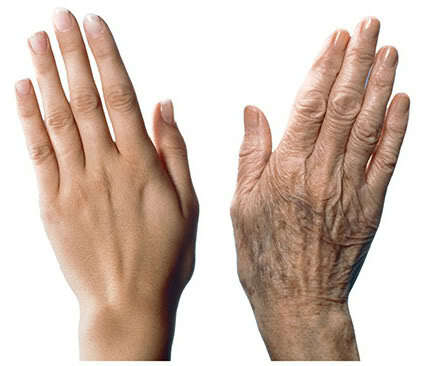 But stem cell treatments are a bit different from simple fat transfer, a refinement of the process if you will. In a true stem cell treatment, once the adipose tissue (the fat cells) are removed from the body, the actual fat is separated from the richer stromal vascular fraction (SVF) cells, which are far more potent than the remaining fat cells. Once separated from adipose tissue, they are reinjected into the patient’s body without further manipulation. The SVF cells are neither cultured, further enriched or changed in any way. Dr. Kisner went on to explain how fat grafting, one technique being used to circumvent this problem, involves injecting small amounts of fat (less that 0.1 cc at a time) in discrete layers to gradually build new tissue layers. By allowing time and space between these microinjections, new blood vessels are able to grow within the grafted fat, enabling them to establish permanence. Aside from the skill and specialized training of the surgeon, he emphasized that fat grafting is a slow process that requires patience on the part of both patient and surgeon. In this same chapter, Dr. Kisner spoke about pioneering research now underway to separate the fragile stem cells, in order to enable them to more readily produce their own blood supply. That said, you can see why this emerging technology of SVF cells holds huge promise not only to the field of cosmetic surgery, but to the pioneering field of regenerative medicine, by enabling the body to repair, replace, and regenerate damaged, aging or diseased cells, tissues and organs. Funny how things happen through connections over the Internet. I recently posted an article, Stem Cells in the News, where I spoke about a stem cell procedure gone wrong after a surgeon injected both stem cells and derma fillers into a patient’s face, causing a well-meaning but disastrous result. One of my readers, Jonathan Schwartz, commented that this was true stem transfer facelifts have not been FDA approved. We got into further conversations, spoke on the phone, and he subsequently sent me further material to digest. It turns out he is the President and CEO of MedicalMarvels LLC, a company doing pioneering efforts in regenerative medicine. A large body of scientific evidence suggests that adipose-SVF may act by replacing lost or damaged cells, reducing inflammation, improving the function of cells at the site, and recruiting cells from other parts of the body to assist in these processes. There is at present no benefit is payable, either by Medicare or by a health fund for adipose-SVF treatment. You may be able to claim a tax refund of 20% of the cost, if your total health costs are above $2,000 in a year. We recommend seeking independent advice in this area. Medical Marvels LLC is an emerging leader in regenerative medicine using adipose (fat) derived stromal vascular fraction containing adult stem cells for pioneering regenerative medicine. Regenerative Medicine is a rapidly expanding set of innovative medical technologies that restore function by enabling the body to repair, replace, and regenerate damaged, aging or diseased cells, tissues and organs. To date, this company has developed proprietary technology that allows for the efficient and reproducible separation of stromal vascular fraction (branded “Cellication”) containing adipose stem cells and extracellular matrix that can be performed in doctor’s offices, medical facilities and hospitals. This company is also engaging in clinical studies at major medical centers to obtain FDA approval for clinical indications. Stay tuned folks. We haven’t heard the end of stem cell face lifts yet! To get notification of my future beauty postings, click on the word FOLLOW in the upper left corner at the top of this screen. But if you also want to read inspiring stories from my Tales2Inspire “Authors Helping Authors” project/contest, FOLLOW my blog at: http://www.winningtales.wordpress.com. Or get them all in on place if you LIKE my Facebook author page at: http://www.Facebook.com/tales2inspire. Hope to welcome you soon.